The tale picks up where Mask of the Phantasm ends. Batman sees Phantasm and Joker disappear. Turns out Phantasm and dropped herself and Joker down into a sewer system. An explosion separates them, and the Joker gets away. Phantasm vows to leave Gotham. Three years later, Andrea Beaumont returns. As Phantasm, she interrupts an assassination attempt on Bruce Wayne at a fundraiser. Inside, she reveals herself as Andrea to Bruce, and warns him he’s been targeted. They argue, and Andrea leaves in a puff of smoke. Bruce heads to his car, where Alfred is already waiting. Andrea then runs to get in the car, but it’s not Andrea. It’s Kitsune Nozawa, a Japanese assassin that uses an illusion projector in her headgear to get close to her victims. She and Bruce fight in the back of the car, until Phantasm breaks through the roof and throws Kitsune out. Back at Wayne Manor, Andrea explains her life of crime over the last three years. When someone approached her about the contract on Bruce, she rushed to warn him. Just as they are about to rekindle their romance, Kitsune and a group of thugs break in. Bruce jumps out a window and heads for the Batcave, while the villains leave with Andrea. Later, Andrea wakes up to find herself the prisoner of Arthur Reeves, the man who betrayed her father. He’d been infected with Joker’s laughing serum, and his face was permanently stuck in a rictus grin. Everything had been a trap set by him to bring Andrea to Gotham. He’d figured out that she was Phantasm, and wanted revenge for her part in his disfigurement and subsequent fall from grace. Before he can deliver the final blow, Batman rushes in. He frees Andrea and takes out Kitsune. Finally, Andrea (as Phantasm) tricks Reeves into falling to his death. Once again, she seemingly disappears, having stolen Kitsune’s illusion-making device. 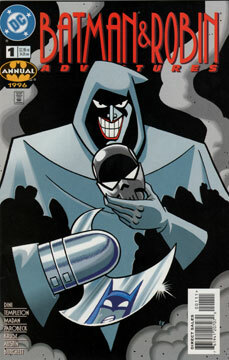 This is a decent enough “sequel” to Mask of the Phantasm, but hardly great. It’s nice to learn the fate of Andrea Beaumont and Arthur Reeves. Their situations are believable. Sadly, the plot is not. Reeves leaked word of the assassination attempt against Wayne to Andrea to trick her into coming to Gotham, so he could capture and kill her. Why not take her out when you leak the information? And random thugs break into Wayne Manor, with no alarms? There was much about this story that was simply too convenient. Perhaps most importantly, though, is the dedication to Mike Parobeck in the back. Mike passed away just before this issue was released. (This was his last published work.) The full page memorial says what many of us have known for years: that Mike Parobeck could create and fill characters with a minimalist cartoon master stroke of his pencil. Even now, almost twenty years later, I get choked up reading it. I can only imagine the heights his art would have achieved with more time. Phantasm never got a decent figure. (So I had to fix that.) And this was the introduction of Kitsune Nozawa (in her first outfit). Not the best story, but yes, worth reading.